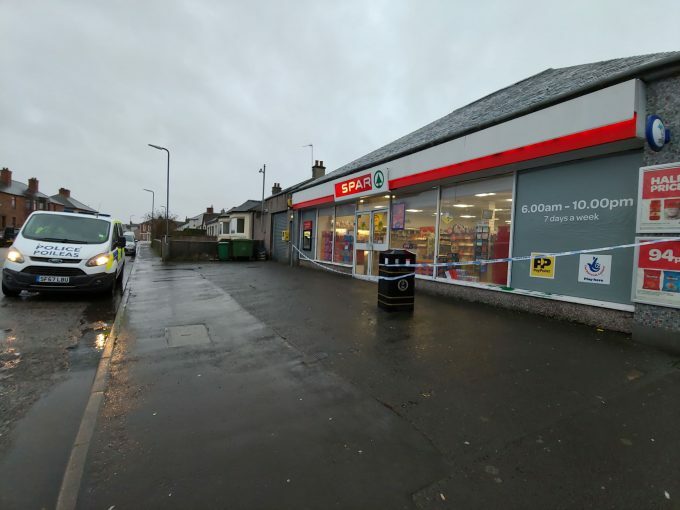 POLICE are appealing for witnesses following a break-in at an Annan convenience store. The Spar store in Butts Street was targeted in the early hours of Friday morning, with a quantity of cigarettes being stolen during the raid. It follows on from two similar incidents in Moffat in recent weeks where cigarettes were stolen from petrol stations. Detective inspector Scott Young said: “Following a recent spike in break-ins over recent weeks we have increased our police presence and officers were on scene within four minutes of the calls to police last night. “Unfortunately the offence’s had already made good their escape. “We are appealing for anyone who may have been around the Butts Street area just before or after midnight to get in touch if they saw or heard anything suspicious. An officer at the scene confirmed that the store will remain closed while police carry out further investigations. Anyone with information should contact police at Annan on 101, quoting reference number 0049 of 08/02/2019, or pass on information anonymously to Crimestoppers on 0800 555 111. Next issue published Friday 26th April 2019. You can now read the latest Annandale Observer online using our new Digital service.